Fortunately for most of us, considering, examining and practicing the art and science of self-defense are done in the abstract; we don't really get to apply what we think we have learned (or have been told). But there is one locale where we must know and practice our defensive skills, and that's on the gun range. I know that after all I've done and lived through in my life, at this late date I don't want to be killed by some fool at the range. 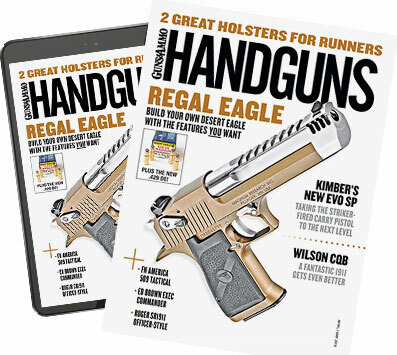 I am not a betting man, but I'd wager there is not one reader of this magazine who has not been on the wrong end of an unsafe gun-handling incident while at a shooting range. Now, while the following might offend some, it's also a safe bet that some readers are guilty of being the perpetrators of one or more unsafe acts while on a range. Actually, range etiquette is no more than a variation of societal etiquette, and, unfortunately, while both are taught (or should be), both are not well practiced. Let's start with the most common unsafe practice: handling a gun or guns while someone else is downrange from you. If and when the gun handler is called on this, he'll invariably reply, "It's not loaded." Of course, some quite complicated rules have been devised to prevent this most common range safety violation. For example, one very well-run range in New Jersey, on which I've held Media Training Events on three occasions, has a range safety officer present, supervising and controlling the line with one rule I very much like. When the cease-fire horn is sounded, everyone is required to back away from their shooting tables to stand behind a yellow line running the width of the range, well behind the shooting tables, where they must remain until the all-clear signal is given. The only problem with this is that it doesn't take into account the guy who drives or walks up to the range with his guns and gear and drops everything behind the yellow line. The point of this is to illustrate the futility of attempting to use rules for safety rather than education and etiquette. OK, Walt, you say. You've identified the problem, but what is your solution? Fair question, this, and I'll tell you what I do and what my home gun club does. I call anyone and everyone on safety violations, without fear or favor, if they happen to me. And I avoid using the range if I know it's going to be crowded, such as on weekends and right before deer season opens. I also offer spare eye and ear protection to anyone who's not wearing them, rather than just telling them they can't shoot, as noted by the well-posted rules to this effect. If there are shooters on the range whom I don't know, I'll hang back and watch them for a while. Since I don't like confrontations of any sort (and I'm sure most of you don't), if there is a safety violation not directed at me or one that has not resulted in a round leaving the range or damage to club property, I'll try to explain how what they did or are doing is contrary to club rules (for example, using the target backer support posts as a place to hang their target). Naturally, some tact here goes a long way. If the precipitating act is no longer an immediate safety issue, get the offender away from others--for example, a father with his child or a guy with his wife or his buddies. Get him away from them so that his reaction to being wrong and being told so in front of them doesn't add fuel to an already lit fire and make the problem worse. On the other hand, if the occasion demands immediate verbal action, do so in the least offensive manner possible. Yelling "Hey, stupid!" or something stronger is not a good conversation starter. As to getting physically involved, I'd only do so if I were sure that doing it was the only option left to me. Backing up a bit, my home club has a very thorough and mandatory new-shooter orientation. The instructor literally reads the rule book word-for-word to the applicant member, with a discussion period afterward. The instructor himself is one of a small group of experienced and trained club members. Range rules are well posted at the sign-in book, at the entrance and on the ranges. In addition, all members are told that they should act as range safety officers themselves and should report violations. The usual version of due process is followed, with notice given to the offender and an opportunity afforded him to defend himself against the charge. The discipline, if so indicated, varies from an admonishment to expulsion. Nice and tidy, eh? The only flaw in this setup is the assumption that no one dies or has a hole put in him. Given the infinite variety of personalities, coupled with many who dislike and actively avoid a confrontation anywhere in their lives (and particularly so if the individual being confronted has access to a firearm), the only solution that has a very good chance of succeeding is making the observance and practice of the rules of gun safety into a form of gun etiquette. In reality, range survival uses all the same tools as are applied to any confrontation, with the same options. Oh, one thing more regarding range survival: Be an example; practice what you preach.